Settling mildly into the sails of the late, lamented Windjammer Barefoot Cruises line, the Island Windjammers aim to recapture that company's quirky traditions and love-for-the-sea elan, without quite so much emphasis on booze. 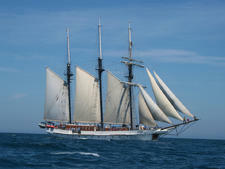 The 101-foot-long Diamant schooner is currently the only ship in the fledgling Island Windjammers fleet. Much smaller than the boats run by the original Windjammer line, the 32-year-old Diamant is a bit short on amenities. But, with its gleaming wood saloon and intimate outdoor dining area, it's big on atmosphere -- and is perfect for a company intending to build its reputation on tall-ship sailing, rather than "foo-foo" flash. The Windjammer Barefoot Cruises story has become a cautionary tale within the cruising industry: How did a company with so much going for it screw up so badly? At the height of its popularity, the company, owned by Mike Burke, had six ships and transported thousands of passengers per year. When the company went bankrupt in 2007, it left its customers robbed of their deposits -- and many crewmembers high and dry in ports around the world. Island Windjammers has sprung from those ashes, so to speak. Through Internet message boards, such as the Flotilla, former Windjammer passengers raised money to help the line's stranded crewmembers. When that was done, they decided to keep going. Overseen by four principals -- all of whom have experience in businesses other than cruise lines -- and a board of 30 investors , Island Windjammers acquired Diamant in September 2009 and put it out on a five-day sail through the Grenadines less than two months later. In its inaugural season, the company's history has proven to be its biggest asset, as many of the passengers who have booked since the cruises started in November 2009 are former Windjammers. 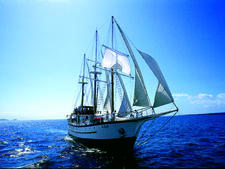 On Island Windjammer's Web site and onboard Diamant, you hear a lot about "keeping the dream alive." For newcomers, such phrases can be a little disconcerting and even cliquish -- until it becomes apparent that the Island Windjammer experience is very different from the "party like a pirate" atmosphere for which Windjammer Barefoot Cruises was known. Diamant is a handsome vessel, a brigantine schooner made in 1978 of fiberglass with a wood interior. As with many ships this size, there are some steep stairs down to the cabins that people with limited mobility may find challenging, if not impossible. Port tenders are done by dinghy, and the crew does an excellent job at helping even the most uncoordinated passengers get in and out of the boat. Feel free to bring your own seasickness remedies, but Bonine and other drugs are available onboard, and ginger snaps and ginger ale are distributed liberally. Despite those precautions, perhaps half of the 10 passengers on a recent cruise got sick -- and the other half thought about it. On a boat that size, you will definitely feel the ocean, for better or worse. Island Windjammers uses some of the same terminology as the old Windjammer Barefoot Cruises. So you'll see "Snacks and Swizzles," essentially heavy appetizers served up with a spicy rum punch, and "Storytime" -- during which the captain outlines the day's itinerary -- listed on the daily white board. The crew still occasionally plays a recording of "Amazing Grace" when the sails are raised, a grand sight for those who love old-fashioned sea-faring culture. When passengers arrive, they find red and blue plastic water bottles placed in their cabins -- welcome and often-used freebies that come in handy in the hot Caribbean sun. Equally thoughtful is a map of the Grenadines, signed by the crewmembers and given to passengers at the end of the cruise. Many passengers signed each others' maps with yearbook-style messages, contributing to the cruise's "summer camp at sea" feel. And...honestly, that's why many passengers will love Diamant and Island Windjammers. It's a chance to see sailing up-close, both the good and the bad, in an informal setting. They laze away the days with their biggest decision being the choice between snorkeling, swimming and reading. At its best, Diamant provides laid-back passengers with a chance to visit small ports and secluded beaches, where a larger ship could never dream of berthing -- and that's a dream well worth encouraging. Come prepared to socialize because, with a maximum of only 12 passengers, you're going to get to know your cruise mates very well indeed. A recent group of 10 -- mostly former Windjammer fans, as well as friends and relatives of Island Windjammer principals, with an average age of 63 -- gelled nicely, with passengers swapping email addresses and becoming Facebook friends. On a cruise that small, however, it would only take one or two obnoxious people to ruin the trip. "Dress code? We don't need no stinkin' dress code." The barefoot philosophy espoused by the original Windjammers still lives on Diamant. Swimsuits, cover-ups and T-shirts are typical daytime attire, and dressing for dinner usually means nothing more than putting on a clean shirt. For the Captain's dinner on the last night, several women put on sundresses, while polo shirts were about as fancy as it got for the men.